How do blind people play football so well? This is an England football team that would never be booed, with silence a necessary part of the game. Watching the national blind team train days before the World Cup kicks off in Hereford, there is a hushed quiet. Whereas mainstream football around the world is played amidst a colourful sonic backdrop – be it chanting, samba bands or a chorus of vuvuzelas – the silence in the blind version of the game is striking. Etiquette dictates that spectators remain quiet unless the ball goes out of play because players need to be able to hear each other and, crucially, the ball. It contains ball bearings which means its motion makes a gentle rattling noise that helps players to locate it. Unsurprisingly, the style of play is different too. Passes cover a shorter distance and, as England defender Keryn Seal explains during the training session, players try not to let the ball stray more than a few inches from their feet, making nimble footwork and a command of the ball vital. “There’s a lot more dribbling and close control than in a sighted game. Communication is very important among the players too,” he says. Mesmeric footwork, accurate passing and the ever-present rattling of the ball gives the game a hypnotic quality that makes it easy to forget that the players can’t see what they’re kicking. There are occasional reminders – perhaps a misplaced pass allows the ball to roll away, or the action stops – and the spectator’s gaze lifts from the players’ feet to the unfamiliar sight of footballers wearing eye patches. 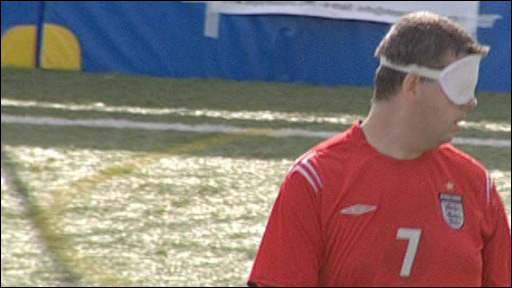 A keen footballer before losing his sight, Keryn adapted his playing style for blind football. The 28-year-old is perhaps more acutely aware of the different football culture in the blind game than some of his teammates, having lost his sight later than other squad members who weren’t born blind. A congenital eye defect suddenly deprived him of his sight – within a two-month period – when he was 20. “It was just one of those things,” he says of that sudden, life-changing experience. Football enabled him to channel his “competitive” tendencies and remain active. 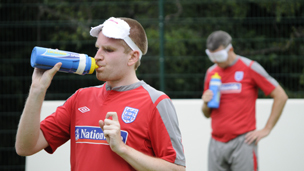 The wing-back, who has represented England on 44 occasions, hopes to be among the stars at the World Blind Football Championship which kicks off on Saturday at Hereford’s Royal National College for the Blind (RNC). Much of the host nation’s hopes for success in the 10-team tournament rests on the broad shoulders of David Clarke, the team’s talismanic captain, akin to a Steven Gerrard figure. In training, he’s often at the centre of the action – his rapid feet delicately stroking, pushing and pulling the ball with balletic alacrity before unleashing a string of powerful, accurate shots. “It’s really important to have good ball control because if you lose control it’s very difficult. A lot is about getting your touch right,” says David, explaining a playing style that has led to him scoring 108 goals in an international football career dating back to 1996. The veteran striker lost his sight at around eight years of age, having been born with congenital glaucoma. Despite becoming blind at a much younger age than Keryn, who recalls watching his heroes Ian Wright and Dennis Bergkamp play for his beloved Arsenal, David remembers watching football and says it has influenced him. Like his teammates, the 39-year-old from Harpenden, in Hertfordshire, lives the life of an amateur professional sportsman – a double life he admits can be difficult. He is a banker and father-of-two, negotiating the rigours of family life and career while faithfully adhering to fitness regimes, nutritional guidance and practising football drills alone in his garage. It contrasts starkly with the lavish lifestyles enjoyed by the multimillionaire Premier League players who failed so comprehensively in England shirts at the World Cup in South Africa. The blind squad is hoping to do more than win the tournament. This is the first step in a wider plan. As team manager Tony Larkin explains, success in the tournament would act as a springboard for the 2012 Paralympics in London and give more exposure to blind sportsmen and women. There are, of course, several challenges. The biggest one, he says, was adapting his coaching style after he practised playing with a blindfold. It made him realise the importance of close control, short passes and the need to have a short backlift when shooting since the ball about to be struck is often moving. The 54-year-old former professional footballer has been coaching blind and partially-sighted football for 15 years and has overseen the sport’s development which has included a £21.5m, state-of-the-art sports centre at the team’s home at the RNC, as well as the creation of a football academy two years ago. During the manager’s tenure, England has played in seven European championships and five world tournaments. The team is now ranked fifth in the world. The UK’s national blind league has five teams, with a season that runs between October and April. But the game still lags behind other countries. In Brazil, government funding means there are about 80 blind football teams. Players are full-time, as they are in Argentina, France, Spain and China. The England manager wants the world tournament to create a “legacy” in which playing and watching disabled sports become more commonplace in the UK. These sentiments are echoed by 19-year-old Dan English, a product of the blind football academy who has been touted as one of the England’s most gifted young players. “Playing football has helped with my confidence. It’s also improved my communication because I’m part of a team,” says Dan, who will begin a degree in complementary therapy at the University of Wales in September.